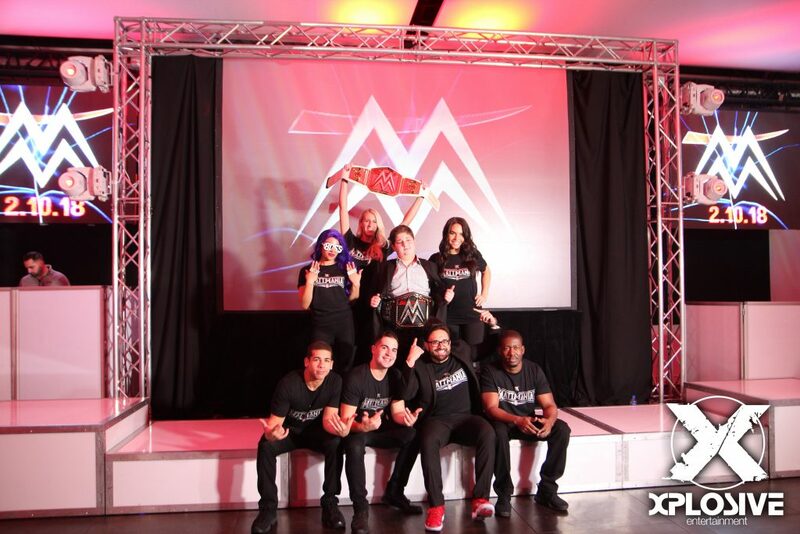 The crowd was going wild for MattMania, February 10th, 2018 at iPlay America’s Event Center! 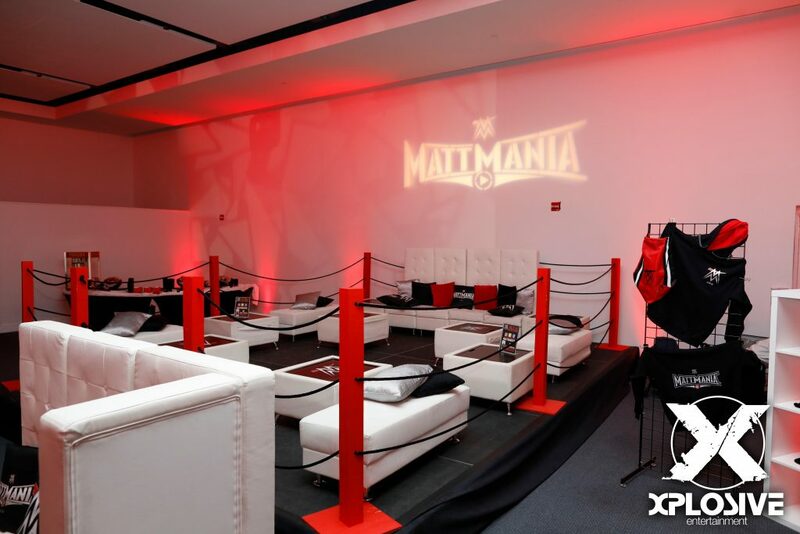 MattMania took a page out of WWE’s playbook and provided fans/guests with a high energy, action packed and technology driven event! MattMania was the brainchild of Jessica Schwartz, mom to Matt Schwartz and VP of Sales andMarketing for iPlay America located in Freehold NJ. Like most other thirteen year olds in the Jewish culture a bar mitzvah is the celebration of becoming an adult. As Matt neared his 13th birthday his parents started planning Matt’s 275-guest simcha. Since Jess is employed by iPlay America, and since Matt loves wrestling so much, the theme and venue decisions were easy. Then after a few brainstorming sessions with Xplosive Entertainment, the puzzle pieces started falling into place. Jordan Marshall, owner/president of Xplosive Entertainment happens to be a huge wrestling junkie. He is a regular “Monday Night RAW” watcher and attends WrestleMania whenever given the opportunity. Along with Jordan’s business partner, Michael Langsner, the two sat with Jess and her husband, Evan, suggesting unique and one-of-a-kind themed elements to fill iPlay America’s 10,000sq ft. Event Center. The first of many ideas included the creation of a mock wrestling ring as the “VIP” section for the kids to sit. 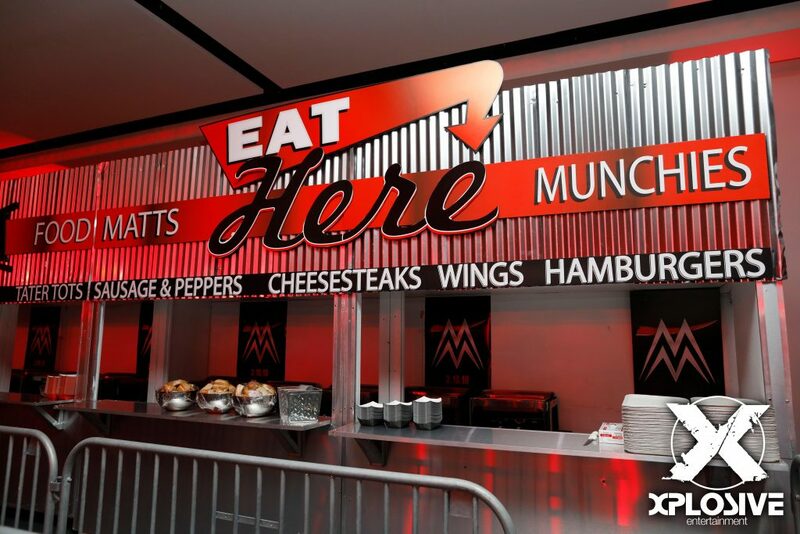 Next was a concession styled food stand built to scale and rather than the expected steak, chicken or fish banquet food at a regular bar mitzvah, a stadium inspired menu was provided. 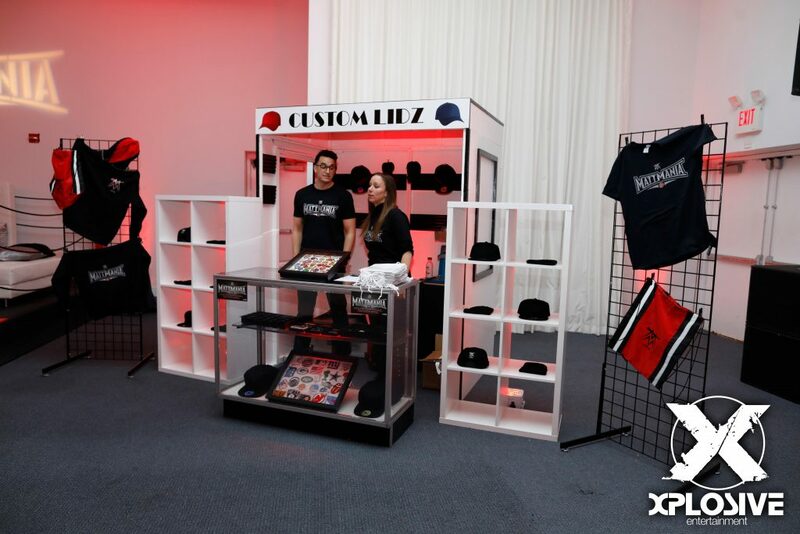 A personalized “Merch Station” was also built offering guests personalized logo’d MattMania hats. Possibly the most impressive item within this themed simcha was the focal point of the room, the custom themed stage and backdrop. WWE is always at the forefront of technology including lighting, social media, video production, etc. The same applied for Matt’s bar mitzvah. In synergy with the experienced AV and production staff at iPlay, Xplosive brought in a two-tiered 24ft long LED illuminated stage. Behind the stage sat a 16ft long rear projection screen flanked right and left with iPlay’s twin 10ft LED video walls. 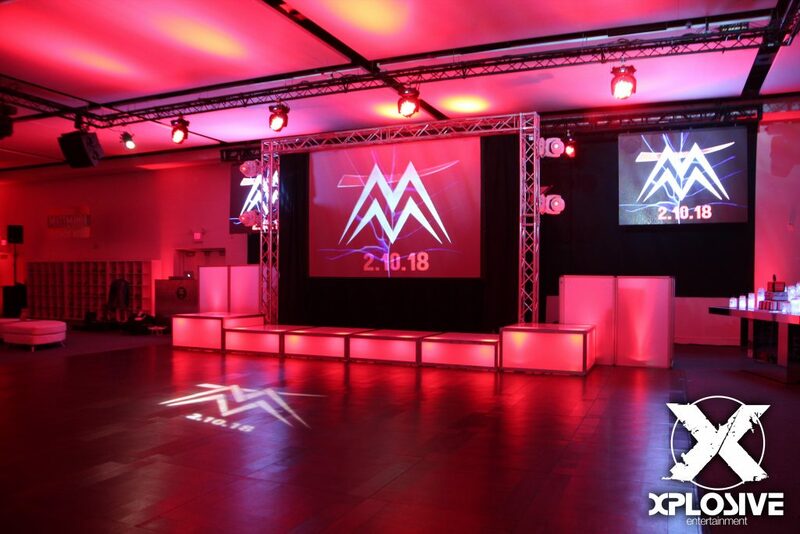 To add to the rugged and industrial look of a wrestling event, Xplosive built a 12ft tall bare metal exposed “goal post truss” to surround the video screen and to mount an array of moving head light fixtures. This gave the look of the WWE Titantron that is a cornerstone piece at all WWE events. Xplosive’s crew consisted of a DJ, MC, five dancers, lighting tech and an on-site logistics coordinator. Xplosive worked hand in hand with iPlay America’s food and beverage director and AV manager. In fact, Xplosive provided “human tables” to butler pass appetizers to the adults during cocktail hour as well as having one of the entertainers, in official Sasha Banks (a WWE female Superstar) swag as a “Look-a-Like” to dance and take pictures with all the guests. Looking past the technology and entertainment, great credit is owed to Debbie’s Designs who was responsible for making many of the ideas come to life. Iris, from Debbie’s Designs took charge and led her team to build the concession styled food stand and kids VIP ring. Her team also provided centerpiece décor and affixed printed vinyl decals to bars and other acrylic accents throughout the room. Credit should also be given to John Amon, of Rocket-9 for designing Matt’s logo, and Dana Kaufman of By Dana for the invitations, custom photo booth props, and other themed elements throughout the room. This party was a perfect example of creative minds coming together to execute a stellar themed event. Each participant, throughout the planning process, provided a unique set of traits allowing this event to come to fruition. There were so many details to note including a custom “entrance video” to a themed photo montage on the screens, a confetti blast at Matt’s entrance, an incredible themed tiered cake, t-shirts for the staff and much more! The ultimate success of MATTMANIA that incredible night was really proven during the moments of Jess rapping (over the mic) to Slim Shady, (her son’s favorite artist), dad singing along to his favorite old school jams and the epic moment when Matt grabbed the mic at the end of the night and entirely unsolicited proclaimed that “This was the best night of my life!” The dance floor was packed all night. Guests danced, ate, and helped Matt and his family celebrate from the moment the doors opened through the very last song played. Photo credit throughout this blog goes to the very talented Matt Kirchhof or Kirchhof Photography.